SQ-PM Electro-permanent magnetic clamping systems for zero-point systems and palletizing. Electro-permanent magnetic clamping systems allow to use the advantages (cable independently) of electronic controls. Clamping plates of the series SQ-PM therefore are particularly appropriate in HSC milling and eroding where high-alloy steels are processed. The dual Alnico Neodymium magnet system provides at minimum height for maximum holding power. The square pole technology ensures the same holding power in all directions and allows the use of pole extensions to release the workpiece or to stretch without distortion. When switching on the UCS electricity control the ST100F polarity reversing control unit checks , whether it is fully magnetized and makes sure that the workpiece can be removed easily after switch-off . SQ-PM magnetic chucks are available in 2 versions. SQ PM – SL50 with only 35 mm thickness and correspondingly low weight, this chuck reaches with an air gap of O mm a holding force of 56 kN, the magnetic field penetration depth is 10 mm. 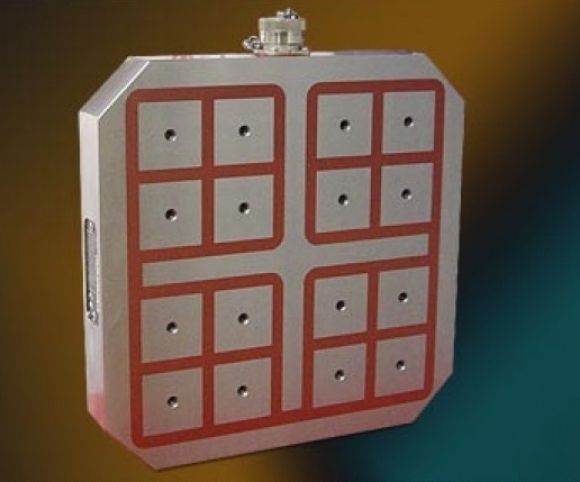 This plate is provided with a waterproof connector system. It is designed for light milling and grinding as well as eroding. Only suitable for pallet building. SQ PM – HD50 with only 48 mm overall height the chuck reaches a holding force of 56 kN with an air gap of 0,2 mm. The magnetic field penetration depth is 10 mm. The chuck is provided with a waterproof connector system. This plate is designed for milling, also with pole extensions. Reference elements may be placed at the back.